Do you or your company sponsor a Corporate Golf Day or Tournament? At DROP we affer a wide range of special services. 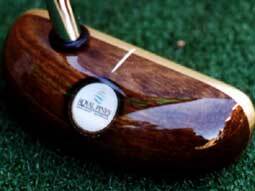 Imagine your company or club logo inlaid into a beautifully grained timber that forms the head of the putter. 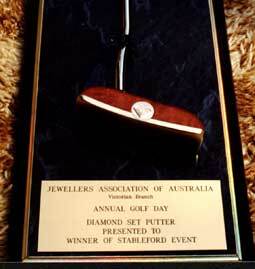 An everlasting memento for the owner and an everlasting advertisement for your Company or Golf Course. We supply badged putters for many prestigious golf courses around the world. Australia: Victoria Golf Course, Yarra Yarra, Royal Pines, Sanctuary Cove, Palm Meadows and Hope Island. International: Kaanapalli Hi, Wailia Hi, Chootoola Fl, Phuket Country Club Thi, Elephant Hills RSA and many others.